﻿ How to Tell If a Government Grant Offer Is a Scam » Red Mango Marketing! You get a call, email, or letter from the federal government saying you are the winner of a free U.S. grant. All you have to do is pay a processing fee to receive the money. How do you know if the offer is legitimate or a scam? 1. Did you apply for a grant? Legitimate grants do not show up at your door as a surprise — you have to apply for them. So, if you are offered a grant you know nothing about, it’s most likely a scam. 2. Is a fee involved? Grant applications are usually free as they are sourced at the federal or state/county level with public funds. If you are asked to submit a fee to apply for the grant or learn more about it, there’s good chance it is scam. Asking for an application fee is the number-one way scammers make their money. 3. Is the grant for business or personal use? U.S. grants to a business or nonprofit are for the sole benefit of the company. If the grant is for school, living, or other personal expenses, that’s an immediate red flag that it is not legit. 4. What agency does the issuer represent? Although it may sound impressive, if they are from the Federal Grants Administration, there is no such office. Do some research on the agency to make sure it really exists. 5. Were you asked for either your personal or your company’s ID, or your bank account information? When asked for this information, ask the caller for the proposal in writing. Chances are, you will never hear from them again. There are a few federal grant programs for for-profit companies and many state/county economic development financial assistance programs. At the federal level, the SBA has disaster recovery grants — think hurricanes Katrina and Sandy. Also, some agencies like National Institutes of Health and the Defense Department participate in the Small Business Innovation Research program, which helps companies research tech innovations for possible commercialization in areas that are of interest to these agencies. At the state/county level, there are many financial assistance programs that foster company and job creation in their respective geographic areas. These take the forms of loans, equity investments, and occasionally grants. Often they have matching requirements and, of course, accomplishing the purposes set out. Questions to Ask About a Legit Grant (OR) You Won a Legit Grant — Now What? When you are the fortunate recipient of a legitimate U.S. grant, make sure you understand its purpose and requirements upfront. What can the money be used for? Most grants are not general-purpose funds, to be used for whatever the company determines. They are for specific purposes that meet the mission of the grantor. Make sure the grantor’s mission and you mission are in sync. What portion of the grant can be used for “overhead”? Grants are provided to undertake projects and activities. It takes administrative support to accomplish this, so make sure you understand what amount of the grant can be used for that. What is the timing of the payments? Many grants are provided upfront so the company has the funds in hand to pay for the work. However, some grants are paid when agreed-upon milestones are accomplished or when specific expenditures need to be reimbursed. Unsolicited grants are often scams. Be cautious and do your research before pursuing these offers. When you have a legitimate grant, make sure you understand the terms and conditions to ensure it’s a fit with your company’s direction. Grants are just one avenue for business financing. Explore your options before landing on a solution for your business. Read my previous post: Where Can I Get Business Financing? for information on other options, including microloans, crowdfunding, and peer-to-peer lending. About the author: Hal Shelton’s business planning skills were developed as a certified SCORE small business mentor, corporate executive, nonprofit board member, early-stage company investor, and author of The Secrets to Writing a Successful Business Plan: A Pro Shares a Step-By-Step Guide to Creating a Plan That Gets Results. Suggestions for additional topics are welcome: email Hal directly from his website: www.secretsofbusinessplans.com. 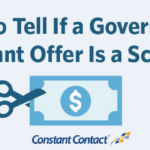 The post How to Tell If a Government Grant Offer Is a Scam appeared first on Constant Contact Blogs. This entry was posted on Wednesday, June 29th, 2016 at 10:30 am	and is filed under Business Tips, Fresh Insights, News & Updates, Small business tips. You can follow any responses to this entry through the RSS 2.0 feed. Both comments and pings are currently closed.